I have been working very hard at finishing my Ebook. 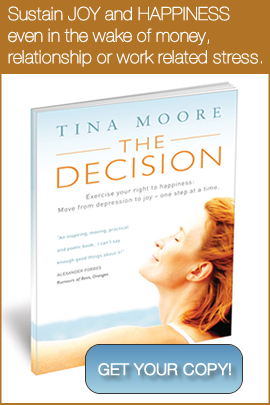 This book shares my transformation from depression and anxiety to joy and laughter by making a life changing decision. I WILL SHARE ALL THE STEPS I TOOK TO MAKE THE DECISION AND ULTIMATELY REACH THE GOAL. It’s a great resource to MOTIVATE, INSPIRE and CREATE CHANGE IN YOUR LIFE! Super excited to share it with you! It’s currently in editing and will be available SOON! This is a 10k jog or 5k walk happening in July. I’ll be jogging with Jody Kennett. Not only is this a fantastic cause but WE GET TO JOG IN OUR UNDERWEAR! I finally have a reason to do it publicly. (Ha Ha) For more information please click HERE. Go to the bottom of this page for all other organized runs I’ll participate in this year. Special Hugs – to Jody Kennett from Leapfit for a thousand and one reasons and to my dear friend who recently had surgery. You are one step closer to running and golfing! Check out the ARTICLE I wrote this week for the Daily News! Women Of Worth Conference – May 7, 2011. This is a fantastic conference that celebrates the magnificence of WOMEN. Want to be inspired? Check it out HERE! I was scheduled to speed train but I’m resting instead. Listening to your body is hard sometimes! Especially when it’s so nice out…I want to JOG!! What a gorgeous day! It is sunny, blue skies and my heart feels happy. I stretched a bit before I jogged today. I don’t do crazy stretches, just enough for the muscles to know I’m going to be using them soon. I jogged along the seawall. I don’t think I’ll ever get sick of that route. It’s stunning and I’m sure I’ve done it a hundred times. My right shin tweaked a couple times so I relaxed my calves and that helped. I ran in honor of my friend who had surgery on her foot today. This one’s for YOU! I saw Benita at Ocean Wellness today. She helped me with my shins by giving me a couple exercises. In regards to the rest of my body, it wasn’t that bad so that’s good! “No Tina, I can’t jog today but you have to because it’s on your training schedule”. She could have changed her mind about joining me once she looked outside and saw how miserable it was. But she didn’t. She faced the wind, rain and cold with me. What a gal! …because we did! We were soaking wet by the first kilometer and we had seventeen more to go. Yes, no option to fail and no option to drown in the pouring rain! I complained as I got dressed, ate breakfast and got in my car, but how did I feel afterwards? FANTASTIC! Jody and I talked and laughed. Blessings, even in the rain. Ah, that Jody, she’s a sweet girl….YES IT’S GOING TO BE IN MY BLOG! THAT WAS PURE TORTURE AFTER RUNNING 18K IN THE RAIN SOAKING WET….ok, not really….actually not at all…it was a challenge and I like challenges. Thanks Jody! I don’t really count this as cross training but it was such a beautiful sunny day I had to get out there…so I walked my happy dog along the trail and did so at a quick pace. Because of the hills, at the end I could feel my calves so I made sure I stretched afterwards. My shoes aren’t dry yet! I took the last two days off to ensure my calves were ok. They tightened after Sunday’s long jog so I’ve been using a rolling pin on them. I massage out the tightness both with my hands and the rolling pin. Works great! ORGANIZED RUNS I AM JOGGING SO FAR THIS YEAR. CHECK THEM OUT AND JOIN ME! WISHING YOU A FABULOUS WEEKEND WITH MANY BLESSINGS. SEE YOU ON TUESDAY!